OK, this is getting a little silly. Bob Maddox, possible lunatic and the world’s pre-eminent expert on pulsejets, has just finished his latest creation. 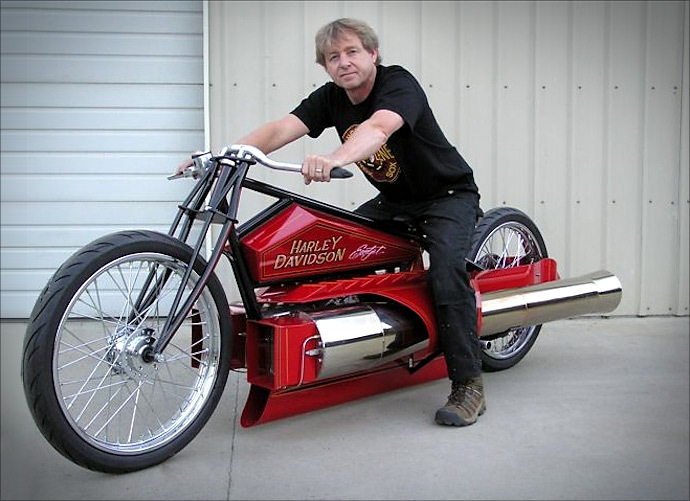 Not content with his pulsejet boardtracker we featured previously on Pipeburn, he’s gone and mounted a monster pulsejet with a split exhaust onto a bike he’s calling the Harley Davidson Sportjet. Apart from a Harley-ish tank design I’m not quite sure what it has to do with Milwaukee, though it would seem about as safe as your average Harley and probably has the handling to match.